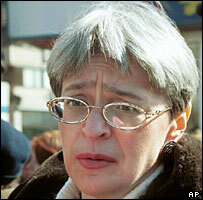 Russian journalist Anna Politkovskaya won international recognition for her passionate reporting work on the conflict in Chechnya in which she sought to expose human rights abuses. Detained on occasion by the Russian military, the Novaya Gazeta special correspondent was famous for her book The Dirty War, a collection of articles mainly about the second Chechen conflict which began in 1999. In 2004, she was a joint winner of the Olof Palme Prize for human rights work. The citation reads that she was "noted for her courage and strength when reporting in difficult and dangerous circumstances". Born in 1958, she graduated as a journalist from Moscow State University in 1980 and worked on the Soviet newspaper Izvestiya for more than a decade. In 1999, she joined Novaya Gazeta, one of the few national Russian newspapers to take a consistently critical line on the Kremlin. She frequently travelled to Chechnya and the North Caucasus where her dispatches described some of the horror of a war where most of the casualties were civilians. "Living streets full of dead eyes. Mad and half-mad people. Streets teeming with weapons. Mines everywhere. Permanent explosions. Despair." Her polemical style earned her many critics in Russia but her stories stood out from much of the mainstream Russian media and she pursued them at great personal risk, whether reporting from the war zone or receiving death threats in Moscow. In October 2002, she was one of the few people to enter the Moscow theatre, where Chechen militants had seized hundreds of hostages, in a bid to negotiate. In 2004, she tried to go to Beslan during the school siege but fell ill with food poisoning on the flight there. Some suspected a plot to incapacitate her. The same year her book Putin's Russia: Life in a Failing Democracy depicted Russia as a country where human rights are routinely trampled upon. Politkovskaya's last known article for Novaya Gazeta, published on 28 September, is a condemnation of pro-Kremlin militias operating in Chechnya as part of Moscow's so-called Chechenisation policy. "Chechnya was always her main subject," Vitaly Yaroshevsky, the newspaper's deputy editor, told Reuters news agency. "Everything she wrote was on the edge."